Arthur Benjamin, also known as the Mathemagician, mesmerized students at assembly this fall by being faster than a calculator. Have you ever been sitting in math class and your mouth just dropped open because you were so astounded by what you just heard? To be honest, this probably happens to me two or three times a week. And if it hasn’t happened to you, just wait. It will. In fact, it might have happened a couple of times in assembly on Friday, October 27. That’s when Arthur Benjamin, a math professor at Harvey Mudd College and a total math savant, performed some really cool tricks. Professor Benjamin has performed on the Today Show, CNN, The Colbert Report, and National Public Radio. He has been interviewed and written about in The New York Times, The Los Angeles Times, USA Today, Scientific American, Discover, OMNI, Esquire, Wired, People Magazine, and Reader’s Digest. He has given three Ted Talks with some enticing titles: “A Performance Of ‘Mathemagic’,” “Teach Statistics Before Calculus!” and “The Magic Of Fibonacci Numbers.” He’s also authored or co-authored a number of books on the art of mental magic if anyone wants to advance their math skills, as I probably should. 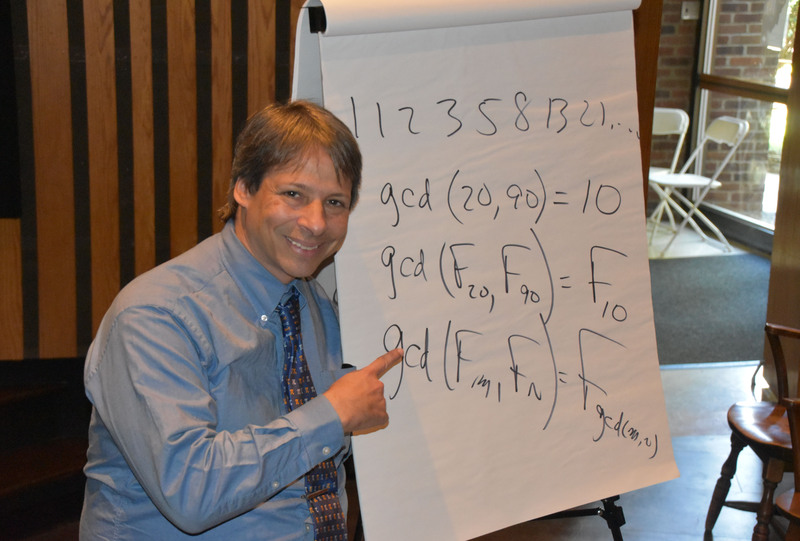 Professor Benjamin began his George School performance by squaring two-digit numbers faster than audience members could type them into their calculators. Then he squared three-digit and four-digit numbers. For his finale, he squared a five-digit number. Mind you, he did all this in his head. I can’t even subtract two-digit numbers in my head, and this man squared a five-digit number! Who can keep track of that many numbers—in sequence—in their head? Professor Benjamin’s mental math skills were astounding. Having warmed up with squaring three- and four-digit numbers, he took one of the squares and had a panel of five people multiply it on their calculators by any three-digit numbers they could think of. That was 499 possibilities, mind you. Then he had the panel read out their answers in any order. From just that information, he could tell the audience the last digit in each sequence. Max Malavsky ’18, one of Professor Benjamin’s onstage “guinea pigs,” remarked, “that’s crazy” when the professor got the last digit of Max’s answer right. Max certainly spoke for all of us. I meant Jenny’s number, of course, and it really was. The rows, columns, diagonals, corners, and two by two boxes all added up to forty-three. Professor Benjamin’s second-to-last trick, right before his finale, seemed to have little to do with math. He was able to tell audience members the day of the week they were born on from the date of their birth. He could go all the way from the time the Gregorian Calendar became popular to thousands of years into the future. He did explain at the end that he knew because of the way the numbers added up, but unfortunately, we didn’t have enough time for him to tell us exactly how. This assembly was incredibly engaging. I have never had so much fun feeling so stupid. The most incredible part was that he did it all in his head. He never touched a calculator. Some people are just born to do math! It’s in their genes, I guess. The rest of us? We have to work at it.